Each new development in the mass media has elicited highly charged criticism from alarmed observers. Comics, romance novels, music videos, and even movies, radio, and television have all been denounced as threats to children, teenagers, adults, and even the stability of civilization itself. Organized into community groups, citizens have repeatedly taken militant action against the media, ranging from book burnings to blacklisting and from harassment of individual publishers to attempts to regulate entire industries. Investigative committees and commissions are not uncommon. What is it about the media that generates such attacks? 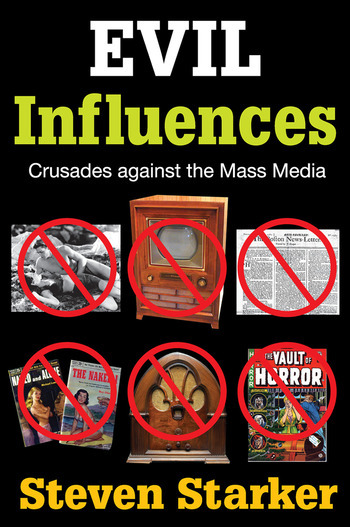 'Evil Influences' examines the historical, sociological, and psychological background of current controversies regarding the media. Starker finds that even though it is couched in logic or scientific theory, such hostility is almost always a byproduct of fear--fear of imagination and fantasy, fear of change, fear of human aggression and sensuality. Successive media developments have challenged traditional perceptions and habits by introducing powerful visual and emotional elements into mass communication. Because they frighten and threaten a part of the audience, new forms of mass media engender public outrage and become easy scapegoats, accused of everything from stimulation of violence to promotion of conformity. This book is addressed to those who inevitably participate in media debates--social scientists, educators, communications professionals, the clergy, and educated parents. Its intention is to prepare us for the arrival of new media forms and their associated threats.